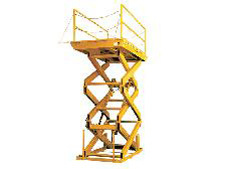 144" High Travel Triple Electrohydraulic Scissor Lift Table (60"
This 144" High Travel Triple Electrohydraulic Scissor Lift Table (60"W max) is designed and constructed for heavy-duty applications under the toughest working conditions, offering years of trouble-free operation. The features include scissor leg roller entrapped within the base frame and platform, mechanical upper travel stops, and smooth steel tops. All controller components are UL and/or CSA approved. Specs: See table below. Available power supplies are 230/460V, 3PH, 60Hz continuous duty (standard) or optional 230V, 1PH, 60Hz. Notify me of updates to 144" High Travel Triple Electrohydraulic Scissor Lift Table (60"